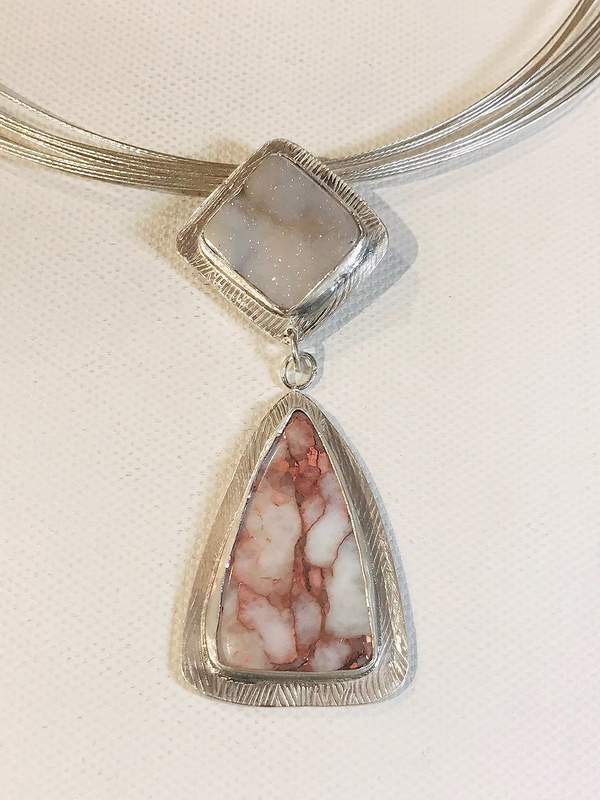 The 2019 Celebration of Fine Art is in its final five days – be sure to visit Suzanne Brown Jewelry Studio #230 to see this amazing pendant and more. The intense copper in this naturally organic quartz triangle is nearly a picture-perfect match for Pantone’s 2019 color of the year: Living Coral. Paired in the pendant is a squarely placed white cloud drusy. Both stones measure 1.5″ at their widest point, are set in sterling silver and suspended on a sterling silver wire neckpiece. Pendant measures 3″ overall in length. Copper, known as an excellent conductor of electricity (second only to silver), is thought to direct, transmit and amplify energy and so shares the energic properties of Living Coral. And amazingly enough, this pendant is the newest addition to my 2019 Kaleidoscope Collection. How’s that for serendipity! Be sure to add to the serendipity and energy by coming to Suzanne Brown Jewelry Studio #230 during the final five days of the 2019 Celebration of Fine Art. In Studio #230 you will have the good fortune to find my collections of fine art jewelry in a kaleidoscope of colors. Spotlight On – Celebrate the Brilliants! Spotlight On: The Pink Path @ The White Tent @ Celebration of Fine Art! Spotlight On: Sincerely – Thank You! Spotlight On: Show On! Show Up & Show Off! Spotlight On: It’s Time For Tanzanite! SPOTLIGHT ON: Your Invitation to Celebration!